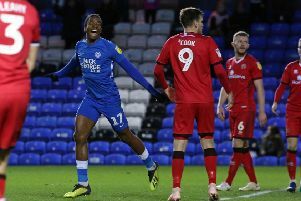 Peterborough United manager Grant McCann hailed the moment of magic from substitute Junior Morias which delivered a 1-0 League One win at Gillingham today (March 25). Morias smashed home the only goal of the game from 25 yards in the final minute of a desperately poor encounter to secure a first win in six matches for McCann’s men. Posh striker Craig Mackail-Smith shoots wide of the Gillingham goal. Photo: Joe Dent/theposh.com. It was a fourth Posh goal for Morias, all of them as a substitute. He was on the pitch early at Priestfield after top scorer Tom Nichols picked up a hip injury which is not thought to be serious. It was a welcome three points after a traumatic week for McCann which saw his assistant Lee Glover dismissed by chairman Darragh MacAnthony. “I was pleased with the character we showed after a tough week,” McCann stated. “We came together as a group and it showed in a difficult game played in tough conditions. “It was a poor game, but to be fair to the players on both sides the pitch was dreadful. Neither team could string three or four passes together. Athletic control from Posh skipper Chris Forrester at Gillingham. Photo: Joe Dent/theposh.com. “The first half was very poor, but I said to the lads at half-time that a moment of magic would win the game and that we have many potential match-winners in our dressing room. “And so it proved as Junior’s goal was worthy of winning any game. “Junior has that in his locker. He was close to starting this game as his attitude and desire to learn is obvious every day. But he can also play as he showed again today. “I was pleased with my back four. They hurled a lot of balls into our penalty area, but they were dealt with well. I was pleased for Luke McGee to get a clean sheet on his return to the side. Posh are up a place to 11th after the win. They remain eight points from the play-off places with six matches to go, starting with a home match against Charlton next Saturday (April 1).